Boxers know that the outcome of a fight is determined before the actual fight. Your chances of winning are based on how much training you put in versus your competition. What's more, it's based on your mental attitude. If you're scared of your opponent or if you're too 'in your own head' then you will be more likely to lose. You'll be more likely to fail. The same goes for pretty much everything in life. Your chances of victory or failure are based on the way you prepare for the event and the outcome then just 'plays itself out'. And that's why planning can help you to survive every situation. The problem is, that too many of us plan only for victory. We make plans based on the assumption that everything will go well and that we will have good fortune. This is a result of a generally positive attitude but it's unfortunately not always the smartest move. What's smarter than is to make sure you're also prepared for the various contingencies. What will you do if you lose your job? How will you cope if your partner leaves you? What will you do if the project you've been working on falls through? This is an attitude that is always taken by businesses because they know it's smart to plan for failure. They will have plans of action based on new releases going well but also just as many that are based on them going badly. Likewise, they will have plans for things go 'just okay'. By being ready for every possible outcome and contingency you will always be ready to deal with situations as they arise and nothing will catch you unawares and unprepared. When making your plans, it can often be a good idea to think of them as a flow chart. Rather than a to-do list, a flow chart works better because it takes into account the fact that situations can change and are uncertain. Your plans should take the form of an 'IF' and 'THEN' approach. To do this, you need to apply a little imagination in thinking of the things that could go wrong. You need to make contingencies not only for likely outcomes but also those that are perhaps less likely. As such, it can also help to look back at past failures and to assess them honestly. By doing this you will have a plan for dealing with every possible scenario. You'll survive any failure and you'll be confident no matter what happens. So we encourage you to internalize the idea that failure is not the end but may simply be your beginning. Here are a few examples of where failure wasn't the final chapter. Steven Spielberg. His cinematic output has grossed more than $9 billion and brought him three Academy Awards, but the master of the blockbuster failed to be accepted twice when applying to the University of Southern California's School of Cinematic Arts. Oprah. She’s a billionaire with her own TV channel and a penchant for giving away cars but Oprah Winfrey was fired from her first TV job as an anchor in Baltimore. Walt Disney. Can you imagine your childhood without Disney? Well it could easily have been if Walt had listened to his former newspaper editor. The editor told Walt he ‘lacked imagination and had no good ideas’. Undeterred, Old Walt went on to create the cultural icon that bears his name. Albert Einstein. His name is synonymous with intelligence yet it wasn’t always that way for Albert Einstein. As a child he didn’t start speaking until he was four, reading until he was seven, and was thought to be mentally handicapped. He went on to win a Nobel Prize and altered the world’s approach to physics. I guess he was just thinking of the right thing to say for those first four years. And the list goes on and on - from Michael Jordan, Abraham Lincoln, Thomas Edison, Vincent Van Gogh, and so on. Moral of the story : Don't let failure be the reason you fail, but ratherthe beginning of your success. We would love to hear your failure to success stories. You can email your story to Connect@totalwellnesscenter.com or we can be reached at (310) 461-4107. Don't forget to sign up below for our weekly Newsletter packed full of inspiration. If you are like so many people, you've set out on a course in life only to discover down the road that you're not passionate about what you are doing. You're working, maybe you even have a "good" job, and from the outside looking in, it appears that you've got it made. But you know within yourself that something's wrong. You're not happy. Going to work every day feels like a punishment. You can't wait to get off for the day, and you just dread the thought of going back the next day. STOP - It is time to identify what is creating your "self-defeating" paralysis. There's a myth that the course you set out on in life is your forever path. People change. What you thought was going to be a sure thing back when you were younger can be different today because you're different. You’ve grown and matured. Maybe you see things that you don’t like about your career, or maybe you don’t like the path you are on as a whole. Don't be the one of many who ends up trudging to work every day stuck in the life that you can't stand. Just know that if you have been unhappy in your job for a period of time the unhappiness will bleed into every corner of your being: mental health, physical health, financial, and all relationships. It just takes the willingness to step out of your comfort zone and discover your WHY. 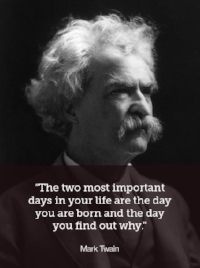 What is your "WHY"? It is your passion, your dream, your reason behind your actions. If you don’t have a strong REASON behind your actions, your actions are less likely to create worthwhile results. BUT ... If you have a strong “WHY” you have all the FUEL you need to drive you forward – to find your freedom, to live your dream, and to fulfill your purpose. Why am I unique from everyone else? Why do I wake up and get out of bed each morning? Is your WHY your family? Is it to prove the doubters wrong? Is it to change your corner of the world? Or is it to fulfill what you have been called to do by a higher power? Regardless of what your WHY is - it is critical to find it and claim it. Write it down and carry it with you everywhere, FEEL IT DEEPLY, and promise yourself everyday you WILL live out your WHY with NO EXCUSES! Once you know your why - It is time for action. Take the next crucial step to understanding the "WHAT"
What does my current support system look like? If you are being weighed down by negative, toxic nay-sayers, it is time to kick them to the curb. What is my life mission statement? What actions do I need to take in order to accomplish my mission? What time frame will I need to accomplish each task? What measurable will I use to monitor my progress? What motivation strategy will I use? What will I do with all my new found freedom and happiness? It is hard to make changes. In fact, it can be down right overwhelming, but when you discover and live out your "WHY" the benefit outweighs the risk every time. If you are feeling stuck I would love to help you move forward. You deserve it! Limited slots available so sign up Today. No matter what business you are in, you need prospects. You need people to market to, in the hopes of turning those leads into customers. Businesses both online and off can benefit from the following 7 you ways to generate more leads to fill your sales funnel, build your email list and hopefully turn into cash-paying customers. It seems everyone has a blog, but few marketers have podcasts. Video and audio podcasts can engage your audience much better than a text-based approach. FollowerWonk.com helps you analyze the behavior of your followers on Twitter. You can also find industry influencers and connect with them, find out what time your followers are the most active on Twitter, and reach the people that are interested in your niche. Imagine these two scenarios. You have 2 almost identical websites offering similar products and services. It looks like either site can help with your situation. One website publishes an informative blog post, videos and a podcasting episode every week. The second site rarely updates its content. Which one will you do business with? Adding information to your blog or website frequently, and on a regular schedule, improves your chances of connecting with your audience. Data.com is just one of many websites where you can find potential leads for your business. You have access to company contact information and other relevant data which allows you to target exactly the businesses and individuals who are the perfect prospects for what you are offering. LinkedIn has hundreds of millions of regular users. It is a professional version of social media sites like Facebook or Pinterest, offering several ways to publish material that you can use to drive serious business professionals back to a landing page or lead generation funnel. People online flock to websites like Quora, Yahoo Answers and WikiAnswers to ask questions about any and all topics. This is a way to prove yourself as an informed leader in your field. The search engines on these sites allow you to target a particular question or topic, and when people see your answers, you can lead them back to your website. There are dozens upon dozens of video sharing sites that attract millions of frequent users. YouTube and Vimeo are just two of the many web properties where you can host videos where you solve real problems in the lives of your prospects. Video "connects" with your target market much better than text-based content. Contest-hosting sites such as RaffleCopter, WooBox and PageModo help you run a simple contest on social media sites. When people think they have a chance to win a valuable prize, they will sign up to your email list or newsletter. A veteran strategy here is to offer consolation prizes to everyone who does not win a main prize. If you are interested in learning more about how to promote your business please reach out to us at Total Wellness Resource Center and ask for one of our Executive Coaches. We love helping people find their sweet spot of success. "The Holiday Christmas Party" oh we have all been there - the laughter, the music, the drinks, a time to let your hair down and celebrate ... But before you throw on your holiday sweater - BEWARE there are risks to all that "fun". Don't let the word "Party" fool you - this is still WORK. Over the years in my career (call it wisdom or maturity) I learned alcohol should never intermingle with any work activity - from after hour gatherings to business dinners. However, during the holidays we are more susceptible to letting our guard down and “throwing caution to the wind” or should I say "throwing your career to the wind". Instead of seeing your holiday party as a "Party" see it as an opportunity because you are invariably socializing with senior executives with whom you do not interact on a daily basis. Make an effort to break away from your comfort zone and introduce yourself to those who might help your career and avoid the one thing that could end it. "Do I drink or just pass?" "Would he take it too far?" Ugh - Wasting Your Time in Meetings Again? Let's face it - people hate meetings, and for good reason. They take up time that could be better spent on producing actual outcomes. Coming from the corporate world I have had my share of meetings - many of which left me frustrated and behind schedule. In fact, it is probably safe to say we have all sat in a meetings where we attempted to hide our eye rolls, as we looked away from the facilitator and glanced at our watch anxious to get back to the deadlines that waited for us. But meetings don’t have to be that way. Is a group meeting really necessary? If so, who and why do they need to be there? Keep in mind, pulling people from their daily responsibilities is costly, so make certain your meeting is result driven. What do you want to accomplish? Have clear goals and objectives. Be prepared. Productive meetings MUST have purpose, structure, and timeline flow. Follow -Up. Nothing is worse than spending an hour out of an already busy day and not seeing the results from the effort. When meetings are necessary and the right stakeholders are in attendance you should use the ORID framework to focus the conversation. Questions are powerful tools for gathering information, sparking introspection, and arriving at decisions. Among the many benefits of the ORID framework is that it provides you with a “checklist” to guide the discussion while addressing all of the different learning preferences of the participants. It is these four stages of questioning that give us the four types of questions you need to use to move meetings forward and achieve the desired results. Your goal is to guide the group through the entire process without solely focusing on one and jumping to conclusions without a full perspective. Objective questions are used to draw out facts, data, and observable reality. The purpose of objective questioning is to ground the participants which helps to later recognize that there may be different assumptions, interpretations, and perspectives involved shaping reality. What is the history of the situation? What facts do we know about the situation? What are the deliverables or what are we trying to achieve? Reflective questions elicit our relationship to data. They allow participants to explore feelings, emotions, and personal connections to a given situation. They also tend to surface our immediate response. Emotional data is often not acknowledged in the business setting; however, emotions are important data and should be taken into consideration when making a decision; they strengthen and support the decision. Ignoring reflective responses will jeopardize the decision. What did you find new or refreshing? What surprised or delighted you? What feels most challenging or worries you? The “So what?” interpretive questions help participants make sense of the situation by examining values, assumptions, significance, and implications. These questions prompt critical thinking and analysis. How might this affect our work? What more do we need to know or further explore? What insights have we unearthed? If we got a chance to do it again, what would we do differently? What are some of our strengths and weaknesses – how do they help or hinder us with this situation? What are the issues underlying the current challenge? What patterns did you see among similar events? Based on information coming from the three previous stages of questioning, this is the stage at which a decision is produced. The key question at the decisional stage is: What are we going to do? You might set the scene for this critical question by recapping the findings of the previous three stages. The focus of discussion in the decisional stage focuses on the future. What would be achievable, positive outcomes? What is realistic given the limitation of our resources? Whew - you made it through a well-structured meeting. Now what? Just as every meeting must start with clear objectives they must end with clear deliverables. Your team has spent the last hour coming up with solutions to drive the business forward so make certain they see the results of their efforts. Set due dates and hold each person accountable for delivering the results. When your team realizes each meeting has purpose and results in a productive outcome and will help them accomplish their job more effectively they will come to the meeting eager to participate. Five reasons you might want to consider a career coach. We have all heard the latest news: "Unemployment is down and job creation is up"
Well, tell that to the thousands who are still seeking work. Just this weekend I spoke with several individuals who speak a different truth. One young man shared his story of finally finding a job 2000 miles away from where he lived and the excitement he felt. However, just 6 months later the company was bought out and he is currently fearing his job will be eliminated. Then there was a woman who told me her company was growing and she is looking to hire 2 new individuals. Now that sounds great except she continued to share that one position received almost 400 resumes and the second one received over 60. I am not an expert on the US job market but I do know there are just few too many jobs available to meet the growing demand for employment. And the few jobs that are becoming available barely pay a wage that covers living expenses. But here’s what a good career coach can do. They can help you stand out above all other applicants. Within just a few sessions a career coach can evaluate the strength of your resume, conduct a mock interview, identify your strengths and your weakness and offer a strategic growth and improvement plan putting you at the head of the pack. Assess your core values and align them with your career and potential employer. Too many times people accept a job with a company that "thinks" differently than they do resulting in frustration, stress, and dissatisfaction. The results of this mismatch can be seen in health problems, relationship struggles, emotional pain, and eventually end up in unemployed … again. Improve job success rate. The call finally comes in from HR and you got the job. Time to celebrate! But wait - the real work is just beginning. The statistics show that over 40% of executive level new job hires fail in their first 12 months. A coach can help you create a successful 30, 60, 90 day plan and equips you to hit the ground running. A well designed plan will move you from a value consumed point (where you take up more resources than you contribute) to a break-even contribution level at a faster speed increasing your visibility to the leadership team and resulting in job security. Prepare you for the promotion. If you are one of the fortunate ones who have a great career with a great company but want to rise within the organization, a career coach can be your best advocate. You've heard the saying "You don't know what you don't know". This never rings more true than with individuals trying and trying to get the next promotion but missing the mark. It is normal to be blinded by our own assumptions and expectations. In fact, sometimes what we see as our strengths can attack us from behind and become our biggest weakness. When we fail to recognize this (and many of us do) we keep ourselves from being the 1st choice. A trained career coach can help assess the things you don't know and help you turn the "don't knows" into your core competencies. Start your own company. If you are at the point where you no longer want to put your future in the hands of others and you desire to create your own business - I strongly advise you to seek out a qualified career coach. In this situation your career coach should have experience in start-up companies. They can walk you through a marketable business plan from raising capital to the launch. Some coaches can tell you "been there, done that" but before hiring one make certain they can say "been there, done that, and succeeded". For many of us it can be tough to admit we could use someone's help, especially if we've created our own success in the past. I recently coached an individual who spent 18 months searching for a job. He had many years of success under his belt and felt no need for a career coach. Through the coaxing of his spouse, he reached out to me and within a month he landed a top paying executive job. The moral of this story is - You don't know what you don't know but don't be afraid to ask someone who may help you see what you can’t see so you can find your way to the career of your dreams. Or Are You Being Pushed or Pulled to Make a Change? Don’t you wish you could peer into the future to see if you are making the right career decisions? When do I move on? The good news is your resume caught the attention of HR and you've just nailed the phone interview. Now the challenging news - you are scheduled for an all-day marathon interview with the company's key departments. The day-long interview is a great opportunity for a company to get a picture of who you are, but also for you to see the many moving parts of an organization. So while these days can be exhausting, try to see them in a positive light. Just be prepared, and you'll do great. Prepare both mentally and physically for a very long day. Many corporations will offer high potential candidates the opportunity to interview with many departments and key decision makers all in one day which can prove to be one of the most stressful events in your job search. Being prepared is critical for any interview but especially critical for the multiple step interviews. Research the company thoroughly and be prepared with a list of perceptive questions on the company itself and the specific job position you are interviewing for. Organize your portfolio the day before – Resumes, notepad, pen, along with your business card. You will need a resume for each person you will be ask to interview with - always have extras for the unexpected add-on interview. Leave a business card behind with current contact information. If you do not currently have a business card go online and create on through Word or Pages. Be prepared with the three take aways you want to leave each interviewer. Pack an emergency care pack in your briefcase - tooth brush, deodorant, and breath mints. Eat a light meal and get a good night sleep the night before. Embrace the fact this is going to be a long day, review your notes you previously prepared. Eat for energy. All day interviews can drain even the strongest individuals. Make certain your breakfast is packed with the nutrients that will keep your brain alert and your stomach quiet. Also, throw snacks into your briefcase, such as; nuts, fruit, even dark chocolate is good if you need a quick caffeine boost. Dress for success – an old cliche but still rings true today. Select fabric that will still look good at the end of the day (Linen may look good first thing but by the second interview you will look like you just crawled out of bed). Always dress professional, better to be over-dressed rather than under-dressed. Remember it is going to be an all day event so make certain you are comfortable. Direct questions around the role of the interviewer - They want to know you are authentically interested in them as well as the different departments of the company. Take notes: This will help you when recapping your day, along with each interviewer's Thank You note. Take breaks between interviews. If they rush you into the next room simply ask for a bathroom break or a glass of water. Take a deep breath, reflect, and refresh for the next one. Enter each interview as if it were your first one. Yes, you may have answered the same questions five times already but remember the person interviewing you sees this as a stand-alone so start it strong and end it strong. You never know which interviewer will be the "make or break" when the team gets with HR to report. Take a few minutes before you head home and review the day’s notes. Make sure to follow up on any action items or request - the sooner the better. Send personalized thank you notes to each person you interviewed with and let them know you appreciated their time. Whew.....it is over and you did great. Your hard prep work paid off and the company realizes you will be a great asset to their organization. Congratulations!